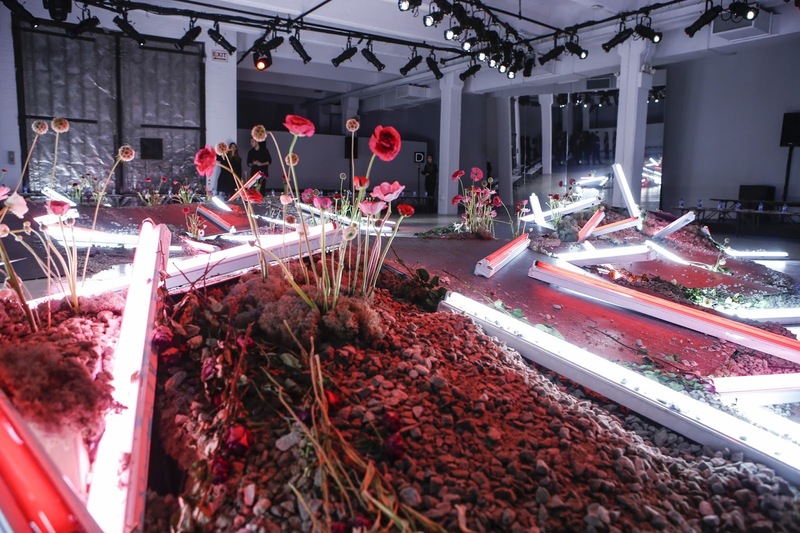 Operating in a world distinctly separate from that of everybody else, the Rodarte sisters Laura and Kate Mulleavy offer up a dazzling dream in their allotted presentation time. You have Thom Browne and Marc Jacobs who exist in a similar sphere but there’s always a practicality imbued in their work. 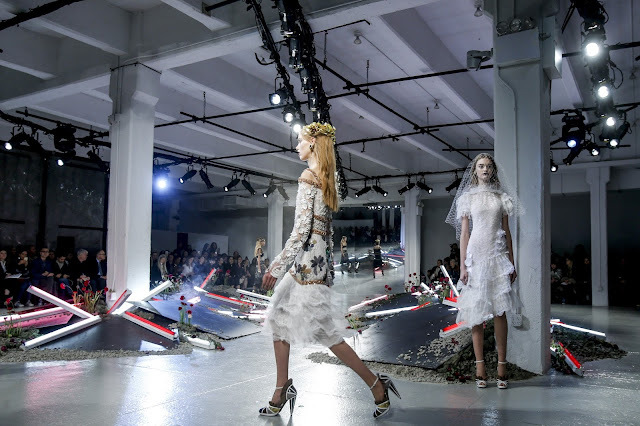 Rodarte is about and for the party girl who’s willing to pull out all the stops and delight an audience unabashedly. For fall 2016, the sisters were inspired by a road trip they took to San Francisco recently. They stopped off at Caffe Trieste along the way. A meeting place for Beat Generation authors (Ginsberg, Burroughs, Kerouac, Carr and Huncke)—Francis Ford Coppola wrote the screenplay for The Godfather at the North Beach outpost. The 1972 encompasses three central themes that the sister looked at in the collection: life, death and love. 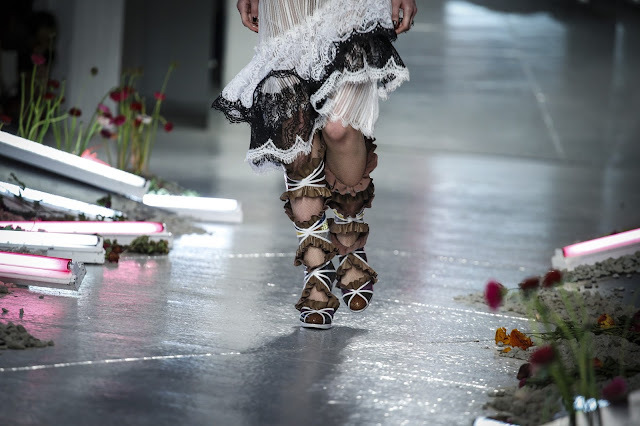 Kiki Willems opened the show swathed in frilled leather and lace tights. An age of innocence was present in the white lace looks with art nouveau swirls (also seen in a magnificent silver dress). 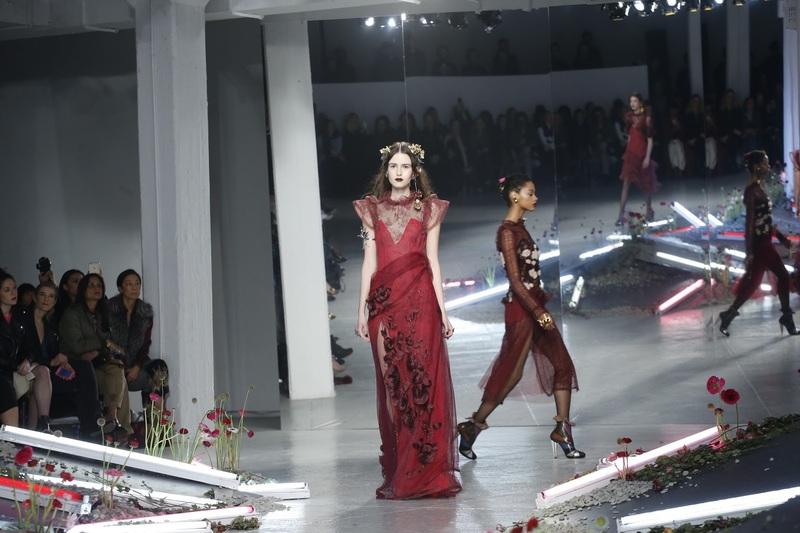 A trio of scarlet dresses completed the trifecta of coloured looks synonymous with the three themes. The Rodarte sisters don’t shy away from weighty thematic influences. Their debut feature film starring friend and show-attendee Kirsten Dunst was a difficult filming experience. The grit transferred to the harshly coloured pieces. Dunst described the duo as storytellers—something that is unfortunately lacking in fashion presently. Jennifer Jason Leigh uttered a sentence in a similar vein, dubbing their work as filmic and romantic. 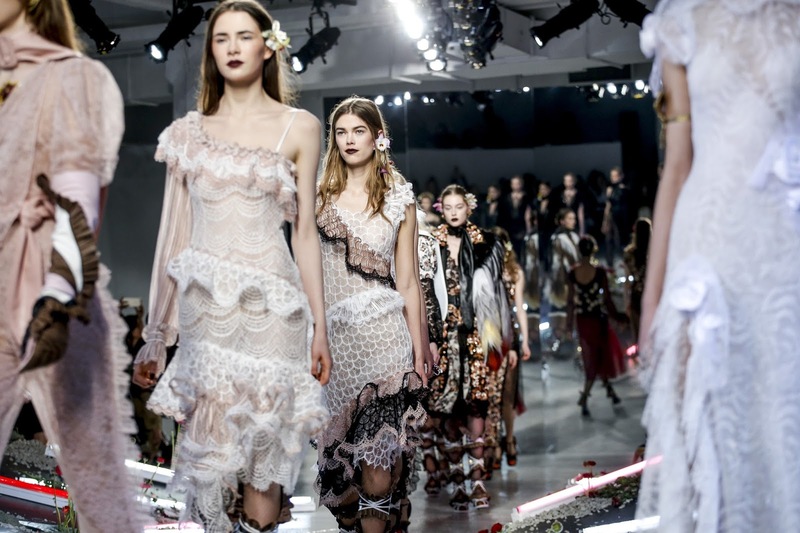 An extension of the Rodarte girl is visible in the inspiration: an intellectual keen on filmic references’; she’s a trippy 70s princess at the best of times. Flower power, ample accessorising, frills and twists. She’s undoubtedly one of the most unique people in fashion. Who does this collection speak to? Well, Kirsten Dunst and Tessa Thompson were eyeing up an aforementioned silver dress. The fur coats are street style bait. There’s some self-satisfying skirts and blazers. The lucky ones, the ones that really buy into the Rodarte dream are those affording the evening gowns and dresses that trickled out through the collection. 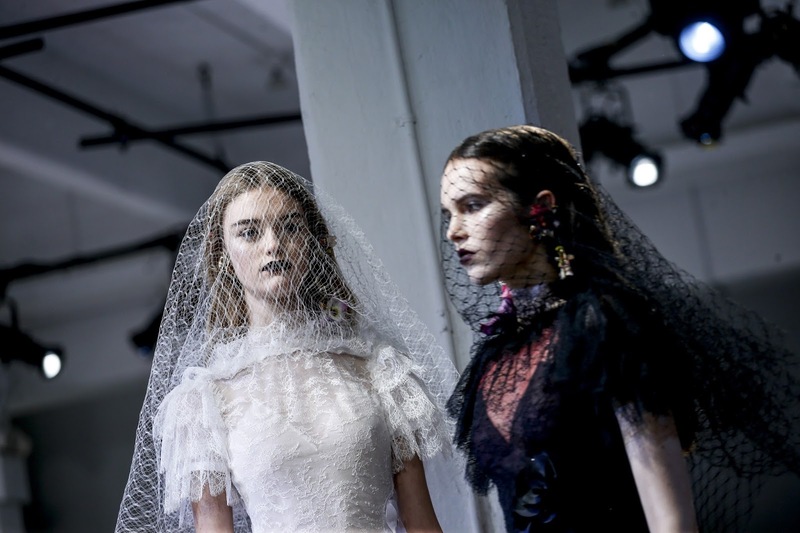 One or two resembled runaway brides. 17-year-old Willow Hand bewitched the audiences, becoming a static presentation as other models weaved around Alexander de Betak’s bed of roses set. A wonderfully staged moment—it made the collection. 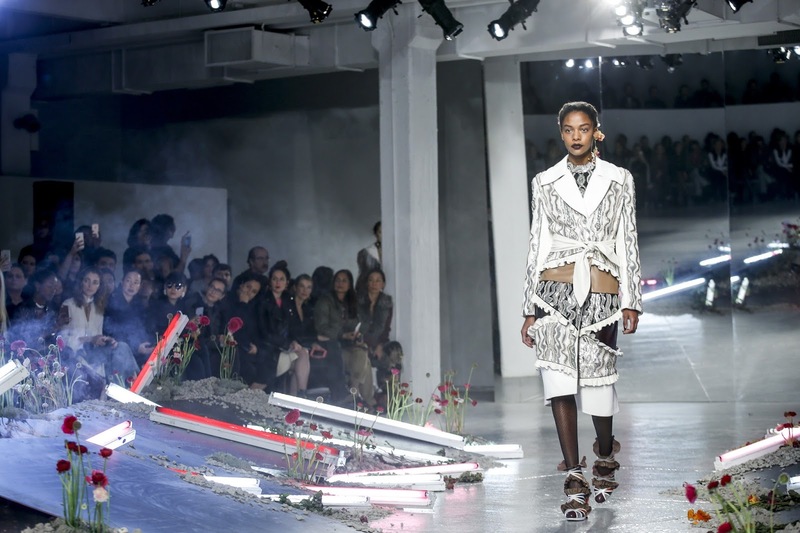 Untrue rumours about the label selling only ‘Radarte’ sweaters were dispelled last year, with a spokesperson for the house reassuring the masses that ready-to-wear business and private client sales were performing well. The clothing also performs well, according to Selfridge’s in London. The rumour mill is tumultuous as proved by the shockingly inaccurate ones about Phoebe Philo’s reign at Céline. 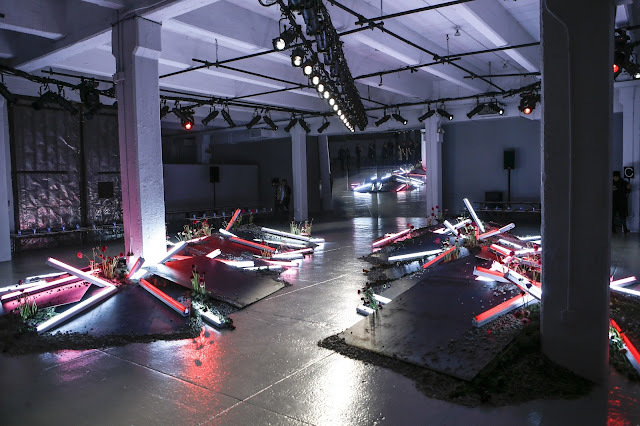 Instead of buying into those falsifications, buy into the Rodarte dream.